I’m an omnivore–and that definitely includes meat in judicious amounts. 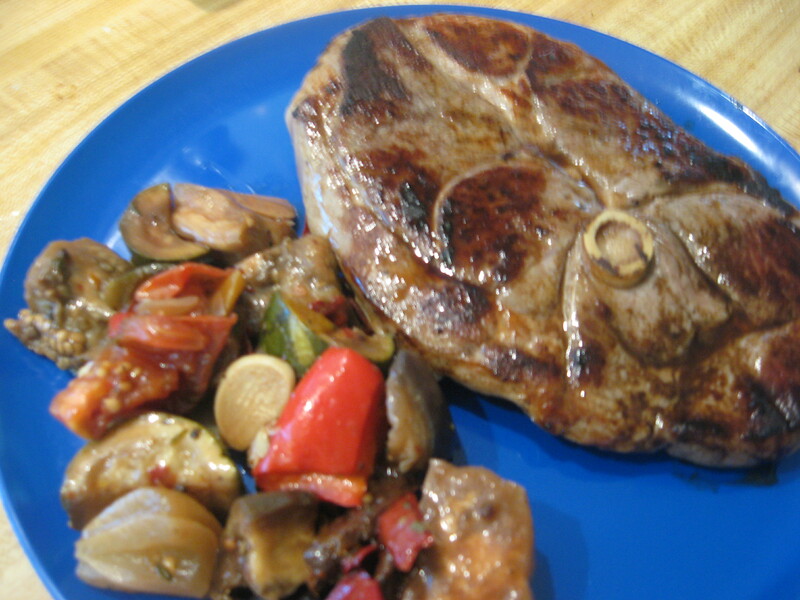 Lamb shoulder chops get frequent use in my kitchen since they are readily available, relatively inexpensive, and tasty. Lamb chops or a rack appear seldom, unfortunately, since they are expensive; braised shank will appear occasionally, but leg of lamb almost never–unless I’ve organized my self to invite lamb-loving friends to share. Even a half leg is just not in the single-serving category, so much as I like it, I don’t get it very often. 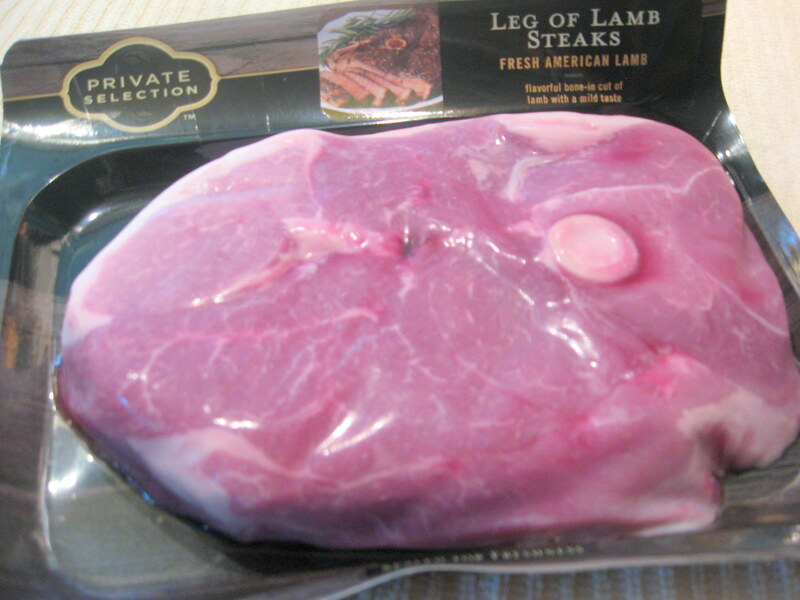 On a recent quick stop at the grocery store, I found a lamb leg steak! Fortuitous since I just happen to have made a batch of ratatouille (slow-cooker testing of a recipe) and somehow those two thing are appealing together. That lovely steak is going to be cooked indoors since it’s grey outside with spatterings of rain off and on–comforting sound on the metal roofing, suggesting a lazy day. 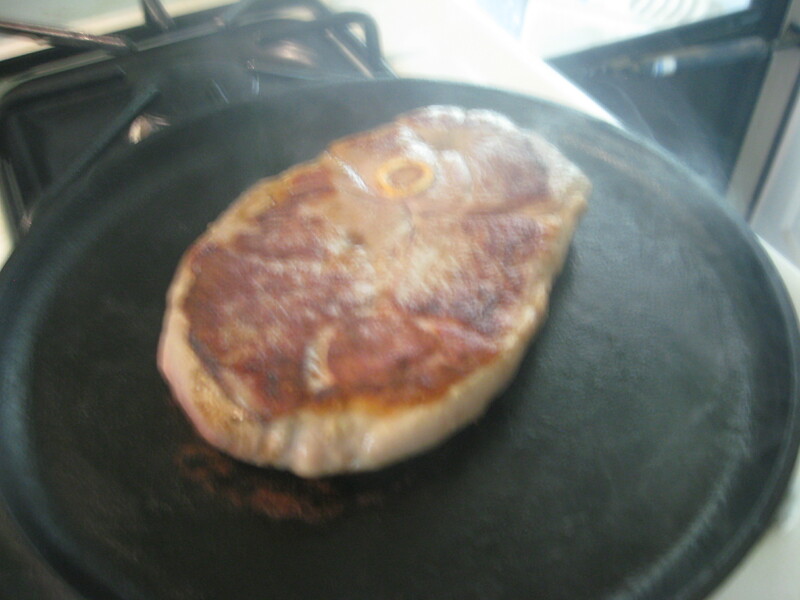 The omnipresent cast-iron griddle is my instrument of choice for cooking steaks or chops indoors. For steaks or chops that are up to an inch in thickness–or perhaps just a tad more–I like to cook them with the method described by Jamie Oliver for pork neck steak. This 1-inch steak weighs in at just under a pound, so there will be leftovers, but as with beef steaks this isn’t a problem–easy to find uses for the leftovers before they spend enough time in the refrigerator to taste like something that has been in the refrigerator. Though this steak could be cooked right out of the package without any preparation, I’m going to give it just a bit of pretreatment. Cook’s Illustrated (and America’s Test Kitchen) have repeatedly demonstrated that brining or salting improve texture and taste of meats. Salting has the advantage of not requiring planning–and it’s easier. The usual procedure is to sprinkle with kosher salt and allow to stand at room temperature for an hour. I’ve found that salting and allowing to stand in the refrigerator overnight works well–I can prep my chop or steak immediately on bringing it into to the kitchen and it will be ready for later. The suggested amount of salt is 3/4 teaspoon for each 8 ounces of weight. 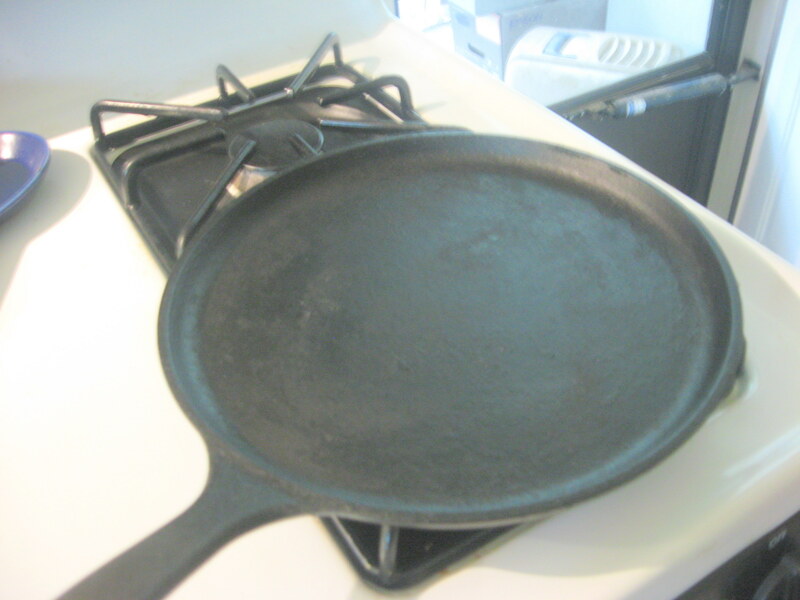 Notes: I prefer a griddle (or griddle pan), not a grill pan that has the ridges on it. The griddle will give you browning all over the surface of the meat, not just stripes on it. Stripes are pretty, but all-over sear really tastes better to me. Deactivate the smoke alarm–probably means taking out the battery. This is necessary before you start cooking because you need to be paying close attention while cooking. (You see the smoke in the picture, right?) There’s no way to do this without it smoking. If you try to do this without smoking, you won’t get the same results. Pat steak dry and rub with a little oil (not extra-virgin olive oil–the heat will destroy flavor) on both sides. Put steak on the griddle–it should make some noise or the griddle is not hot enough, and cook for two (2) minutes without moving it. Don’t turn the heat down. Turn and cook the other side for two minutes. Return to the first side, and cook for one minute; turn over and cook that side for one minute. Repeat the one-minute cook-and-turn until the steak has been cooked for about 8 to 10 minutes total time. Check with an instant-read thermometer if you need to (insert through the side of the steak or simply press the surface with a finger. For medium it should feel the same as pressing on the palm of your hand at the base of the thumb). Let rest for 10 or 15 minutes for juices to distribute evenly, then eat! A dollop of gremolata would be a nice touch; you might even add a bit of mint when making the gremolata. Ever since I discovered this technique of cooking 1-inch chops or steaks, it’s all I’ve used for meats. 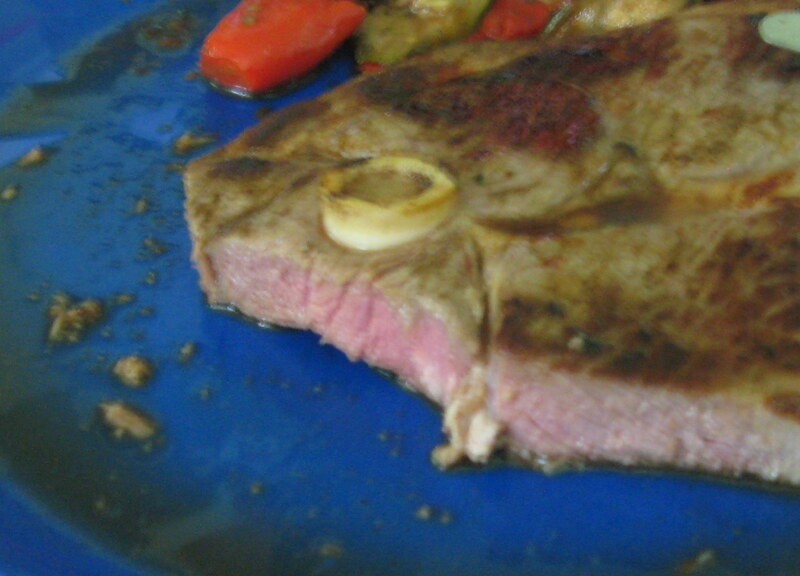 For thicker steaks, I’ll use a combination of pan-searing and oven. I’m sure there’s a good food-science explanation for why this works so well, but I haven’t gone looking for it–I suspect that the heat transfer to the interior of the steak or chop is different than cooking one side at a time, as well as the extremely high heat. True, the stove will need cleaning after you’ve done this, but the result is well worth it. 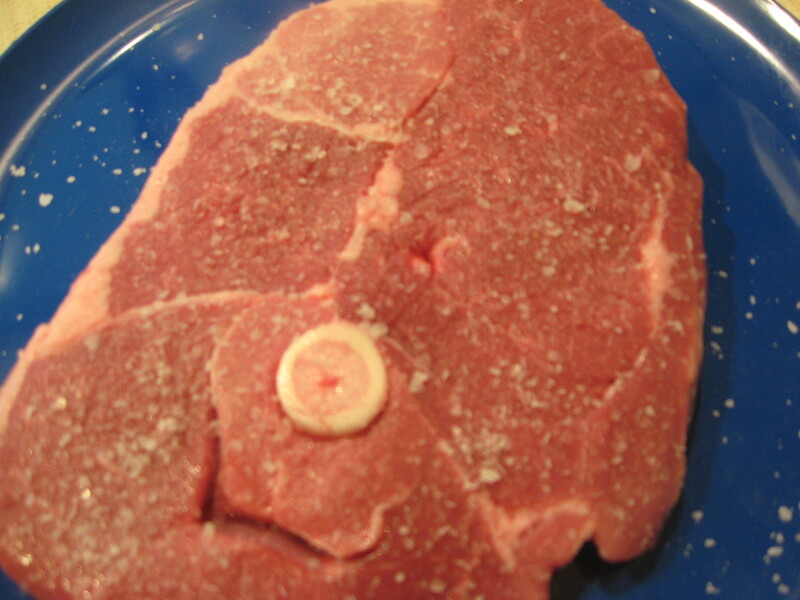 There is no “overcooked” grey area to this steak. This works well with pork, veal, beef, and the lamb.
. . . don’t forget to put the battery back in the smoke alarm!